For breakfast this morning, I indulged in a simple recipe from the River Cottage Every Day cookbook. Cheap, healthy and so damn tasty. Wipe a garlic clove over one side of the toast. Apparently this bit is optional. 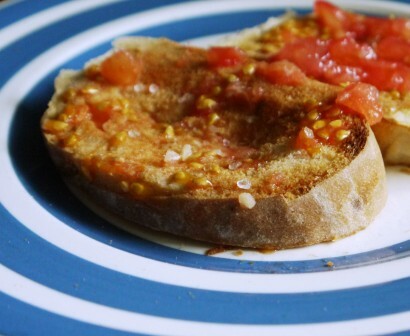 Cut a very ripe tomato in half, and spread/wipe/mush the tomato pulp, seeds & juice into the toast. Discard the skin. Drizzle with a little olive oil and sprinkle with a little Cornish Sea Salt. Simple but effective – will have to try that for brekkie. My thoughts exactly Trevor, even for breakfast! PS are you really a toad? Kiss me and find out! Hope I didn’t offend you!! I’m goona try this for breakfast tomorrow! Sounds yummy! Great way to make a quick appetizer or snack to use up our cherry tomatoes. Stopping by from the Homestead Barn Hop. Hi Becky, thanks for stopping by to say hello! I do hope you enjoy it, it is SO simple and yet SO tasty! What a great idea! I love tomatos and I love toast, I think this is a winner!